Photos from the launch events for our May 2014 report, “Hiding in Plain Sight: Trade Misinvoicing and the Impact of Revenue Loss in Ghana, Kenya, Mozambique, Tanzania, and Uganda: 2002-2011,” which was funded by the Danish Ministry of Foreign Affairs. These photos were taken from the launch events in Copenhagen, Denmark, and in Accra, Ghana. While the precise magnitude and consequences of illicit financial flows in African countries — and throughout the developing world — deserve further analysis, it is clear that such flows are wreaking havoc on the continent. Any sustainable approach to global development has to curtail illicit flows and the mechanisms facilitating them. Only then will we be able to mobilize domestic resources for long-term development. 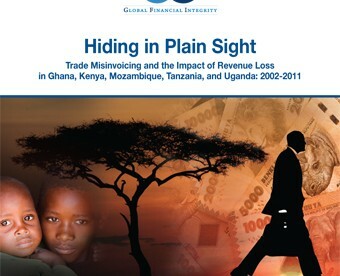 COPENHAGEN, Denmark / WASHINGTON, DC – The fraudulent misinvoicing of trade is hampering economic growth and potentially resulting in billions of U.S. dollars in lost tax revenue in Ghana, Kenya, Mozambique, Tanzania, and Uganda, according to a new report published Monday by Global Financial Integrity (GFI), a Washington DC-based research and advocacy organization. The study—funded by the Ministry of Foreign Affairs of Denmark—finds that the over- and under-invoicing of trade transactions facilitated at least US$60.8 billion in illicit financial flows into or out of the five African countries between 2002 and 2011.